If you’ve ever wanted to see (or taste) a Coexist product, you’re going to love what we’re launching next. Starting this weekend at the Greenbelt Festival, you will be able to do both those things and more at local fairs, festivals and farmers markets. The space was designed to be functional and friendly, allowing visitors to experience the Coexist products and learn about why they’re so special. The booths will vary from site to site, but will usually feature things like coffee tastings, a phone charging station, contests, video displays and of course the opportunity to buy bumper stickers, bracelets, t-shirts and more. You’ll start seeing us at festivals in the US and the UK soon, so be on the lookout for announcements about where we’ll be. Nicole Hamam and Dana Reinert are the brains behind our new booths. 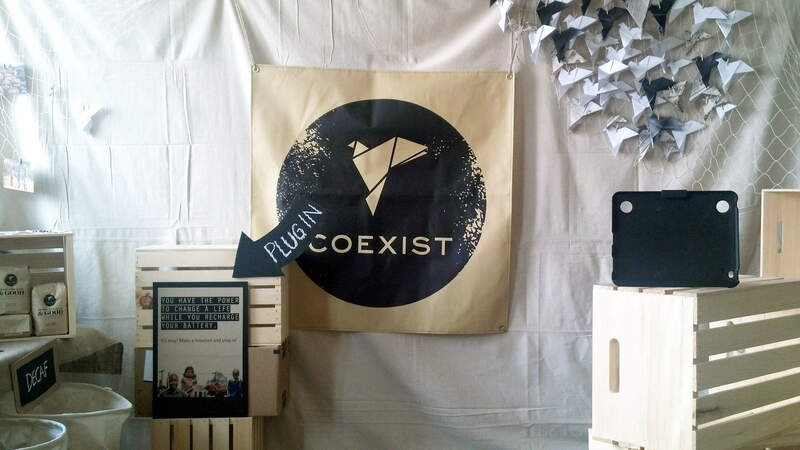 As the Coexist Design Director, Nicole has played a huge role in developing the look and feel of not just the Greenbelt booth, but the Coexist Campaign overall. She has worked on illustration, photography, publication, exhibit design and award-winning branding and design campaigns. Although self-described as “whimsical,” visual display specialist Dana has a knack for spatial problem-solving and has enjoyed working with the Coexist team in support of such a great mission. Some of her past gigs include those bespoke Anthropologie displays, as well as design, illustration and animation. Just like online, 100% of the proceeds from these sales go directly to sending kids to school, so the more you buy, the more you’re helping. Be on the lookout for announcements about where we’ll be in the future, both here in the US and in the UK. Left: Naushin (left) and Nicole use Skype to share the progress of the booth. Right: Dana gives a demo of booth construction to the team.